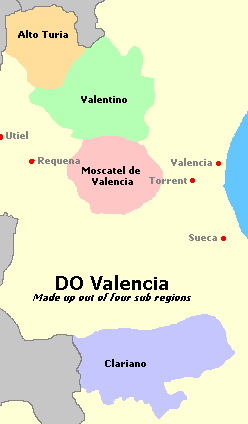 We continue with our series on the Wines of Valencia, and this time we look at the region closest to Valencia city, the DOP Valencia, which is divided into four sub-regions. We discuss the differences between the sub-regions, grape varieties, and give examples of wines to look for when you’re in Valencia. The Valencia area at large is home to a number of indigenous grapes such as Merseguera, Verdil, Bobal and Monastrell; and most of these are found within the more specific region, DOP Valencia. 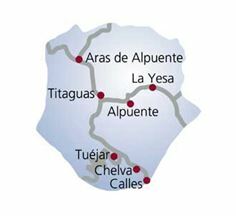 The DOP Valencia distinguishes four main wine producing sub-regions within its territory: Alto Turia, Valentino, Moscatel and Clariano. And they’re all completely different! Alto Turia, in the far north of the DO Valencia, has always been a producer of mainly white wines. The vineyards of Alto Turia lie in the highest part of Valencia, between 800 and 1100 meters altitude, which is more suitable for white grapes. The high altitude means the grapes have a harder time getting ripe, will contain less sugar, and have a higher acidity. Nevertheless, red grape varieties were also planted here in the 1980s in response to an increase in demand for red wine. Alto Turia, sub-region DOP Valencia. As population density has gone down in the last decades, with many young people moving to bigger towns, interest in wine production has also decreased. Many vines have been removed, or simply abandoned, and wine production has diminished substantially. In recent years however, the tide seems to be turning, with a number of wineries trying to produce quality wine. Grape varieties grown in Alto Turia include Macabeo, Bobal and Tempranillo, but the main grape here is the Merseguera (in Alto Turia AKA ‘Verdosilla’). To give you an idea of its importance: about 75% of all grapes grown in the area are Merseguera, and 70% of all Merseguera in Spain is grown here! The Merseguera grape is excellent for making light, crisp, and subtly aromatic wines, which should be drunk young. Perfect for the hot Valencian summers! A good Merseguera de toda la vida (though nowadays some macabeo is added) is Hoya del Castillo of Polo Monleón in Titaguas. Bodegas Santa Barbara, also in Titaguas, produces two pleasant, 100% Merseguera wines: the young Llanos de Titaguas and the oak-aged Mersé, which scored 90 points in the Peñín wine guide, and proves that Merseguera is not just suitable for making young wines, but has also aging potential. Vegamar, a relatively new winery in Calles, produces decent wines with Merseguera as well as a variety of reds. Closer to Valencia city we find the Valentino area, where wine production increased rapidly during the Phylloxera disaster in France. When Phylloxera arrived here in the early 1900’s, production was cut in half in just a short time, but recovered again in the mid-20th century. The region’s wine industry is now dominated by cooperatives rather than private wineries, established to facilitate the export of wine, which has again grown in importance. Currently about 30% of the land in Valentino is used for growing grapes. Vineyards are at very different altitudes (between 175 and 650 meters), near the coast or higher up in the hills, and with many different soil types (even within vineyards), creating conditions for a large variety of wines. Like Alto Turia, Valentino is more suitable for growing white grapes; we find again Merseguera, but also Macabeo, Malvasía and Moscatel, and, though much less, French varieties like Semillon Blanc and Chardonnay. Red grapes are predominantly Tempranillo, Garnacha (Tintorera) and Cabernet Sauvignon, but we can also find Merlot and Syrah. Wines from the Valentino sub-region are not expensive, mostly below three Euros per bottle. However, wines like Laderas, Cerro Gordo, or Balcón de Valencia are not that easy to find in Valencia. Nevertheless, L’Antigon (red, white, rosé) is available at a big supermarket chain, and other wineries sell on-line, like the Cooperative of Alcublas, or by phone or email like the Cooperativa Villar del Arzobispo. It’s not hard to guess which grape dominates this area, which borders Valentino and is just north of Valencia city. The Moscatel grape is a native variety, also called Moscatel de Alexandria. The sub-region’s vineyards are found at low altitudes, from 0 to 100 meters above sea level, where it’s warm and humid; ideal conditions for the Moscatel grape, which is perfectly adapted to the local climate. In the past the Moscatel grape was mainly used for making sweet wine and raisins, but since the 1990s dry Moscatel wines have become popular, and production of Moscatel grapes has been increasing since. Moscatel grapes produce a very aromatic wine, with floral and fruity aromas which may include orange blossom, rose, jasmine, tangerine and peach. The Moscatel grape is also used to make the famous sweet mistela, or ‘vino de licor’, made by simply adding distilled alcohol to sweet grape juice, till it reaches 15% ALcVol. 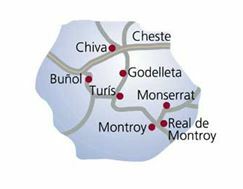 The best known wineries in this sub-region are big producers, like Vicente Gandía for example and the Cheste Agraria Cooperative which produces the well-known Reymos brand of sparkling Moscatel wines. Valsan 1831 has a rare old mistela from 1980 (Cuva Vella), and apart from moscatel wines, also produces an array of red wines. Viñas del Portillo produces decent wines at reasonable prices. In general the wines from this sub-region are not expensive. The Cooperative Baronia de Turis produces ‘1920’, which is probably the best red wine of the region, made of Tempranillo, Syrah and Merlot grapes; a bit more expensive, but worth trying. 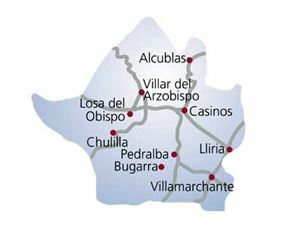 The Clariano sub-region is on the other side of Valencia, about 65 kilometers to the south. It’s considered the best region for wine making in the DOP Valencia. 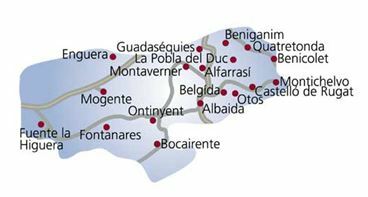 The Clariano sub-region is divided into two parts: the part between Ontinyent and the sea, with predominantly white grape varieties (and with Garnacha Tintorera as the main red grape), and the higher-lying part, more into the interior, where very good red wines are made. The latter is also known as ‘Terres dels Alforins’, and is roughly the triangle formed by Fuente la Higuera, Mogente and Fontanares. 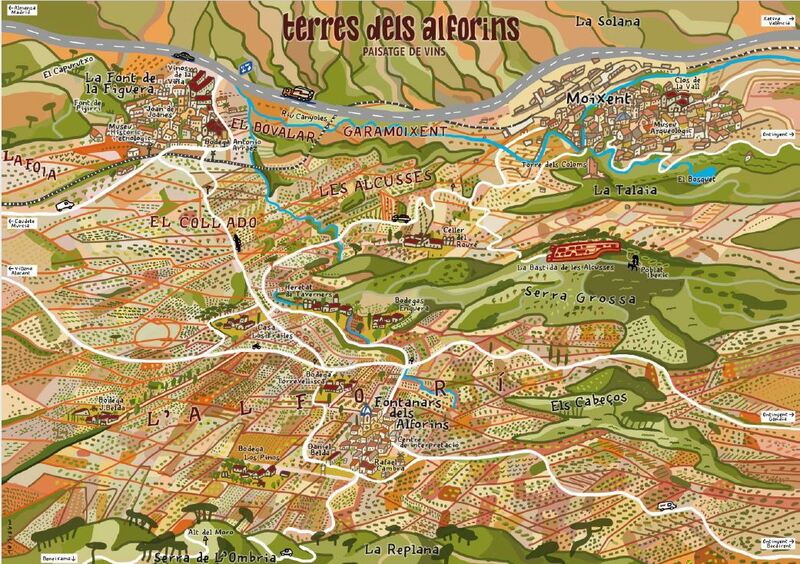 Terres dels Alforins, also known as La Toscana Valenciana, is probably the most interesting part of the DOP Valencia in terms of grapes and wine. There are a number of indigenous grapes that had almost disappeared, as they were uprooted to make space for Tempranillo and French varieties, which were considered more interesting from a commercial perspective. However, in recent years winemakers have started to reconsider and have been looking for remaining vineyards, or even single plants, of those native grapes. They have been successful in recovering some and currently some interesting wines are being made with traditional grape varieties like Mandó, Verdil and Forcalla. 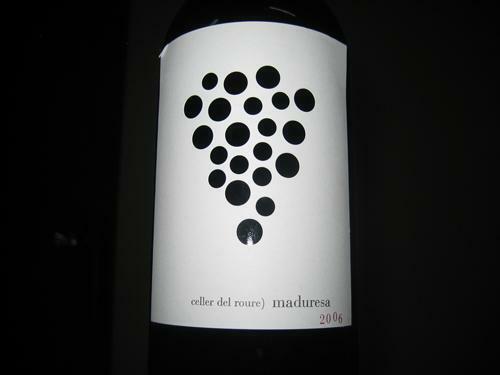 Probably the best known wine from this sub-region is Maduresa, of Celler del Roure. One of the first quality wines from Valencia, it is made with 35% Mandó grapes, blended with Syrah, Monastrell, Cabernet Sauvignon, Merlot and Petit Verdot. It’s a full-bodied wine, with a spicy bouquet of vanilla, pepper and cloves, and tones of coffee and toasted cereals. Don’t miss it! Maduresa, wine from Terres dels Alforins. Celler del Roure is also known for another ‘novelty’, which is in fact a return to tradition: they use 19thcentury tinajas, large clay jars also known as amphorae, of 2800 liters, to make wine. ‘Clay-aged’ for up to 14 months, these wines (Cullerot, Vermell and Parotet) have no outside (wood) influence on their aromas and flavours, but rather display the essence of the grape varieties. There are a number of other, new wineries that make very good and interesting wines. Costera Alta for example is a small winery that makes a 100% Mandó wine, ‘Córdula’, younger and lighter than the Maduresa, but very pleasant. The Verdil grape is used in a variety of white wines, most notably by Bodegas Enguera that makes a nice subtle young ‘Verdil’ (not easy to find!) and a superb ‘Blanc d’Enguera’, a coupage of Verdil with a little bit of Chardonnay, Viognier and Sauvignon Blanc, and 2 months aged in new French oak: a must try wine! Rafael Cambra managed to recover the almost extinct Forcalla grape and now makes a wine, ‘Forcalla’, which has scored 92 points by Robert Parker of Wine Spectator. Bodegas Los Frailes produces interesting bio-dynamic wines, while Heretat de Taverners is the only winery that makes a wine of 100% Graciano, a grape mainly used in La Rioja as a 5-10% blend with Tempranillo; they did a really good job with this one! From the lower part of Clariano, Bodegas El Angosto is worth mentioning, making some very nice white and red wines, like the red ‘La Tribu’ for less than 6€. Terres dels Alforins is a beautiful area to visit, and since it’s not far from Valencia, it’s perfect for a day trip, which could, or should, also include a visit to the excavations of an Iberian village of 400 BC, La Bastida de les Alcusses; really interesting, and with a free guided tour. This article first appeared in May 2016 in the Lens Gourmand blog. The maps of the sub-regions are from the website of the DO Valencia.